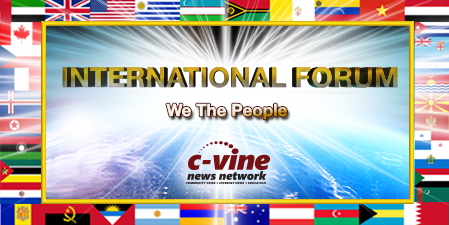 C-VINE International Foundation is a Charitable Trust that is formed for “We the People” AS A COMMUNITY OUTREACH. C-VINE. is a Breaking News & Education (PBS) Media Platform that also raises funds for Disaster Relief or Crisis Management. In addition, we do separate drives for funding our necessary overhead for C-VINE, in order to report the news and provide educational information to the public. At present… we are running a special campaign to raise funds to cover travel, lodging and meal expenses for sending multiple Citizen Journalists to Fort Meade Military Base in Maryland. Each citizen Journalist is trained by us and carefully vetted by the Department of Defense. Once vetted, they are allowed to witness and report on the KSM et al Military Tribunals that are LIVE Streamed via CCTV from Guantanamo Bay (GITMO) in Cuba. All Monies raised are held in a trust fund, and then distributed to the appropriate entity and/or recipient that is also carefully vetted by our Investigative Team of C-VINE Volunteers. We request you consider clicking the “monthly donation” tag when entering an amount. When clicking the “DONATE” button, you may choose to pay through PAYPAL or credit/debit card. We encourage you to leave a note as to where specifically, you prefer that your donation to applied. C-VINE is owned and operated by the general public. DISASTER RELIEF OR CRISIS MANAGEMENT – Raised funds are distributed to the appropriate agencies who are vetted in advance to make certain all funds are used for the fundraiser purpose. NEWS AND COMMUNICATIONS – Teams are set up who have a professional background in LICENSED investigations and are charged with the responsibility to fact check and/or vette the News and assist with Investigative Journalism. Citizen journalists search out latest breaking news and provide content by pointing out news stories from other sources giving full credit. We also have excellent journalists and opinion writers, who create our own news stories. All content must be funneled through the fact checking team before publishing. TEACHING & EDUCATION – Another aspect of C-VINE is to provide public education. An entire Instruction Media Platform (PBS) is available for on-line teaching. All content and individuals who are the alumni, are vetted before published or being allowed to teach in their area of expertise. There are a multitude of media stations in a niche subject matter that contain teachers with a proven history of experience, credentials where necessary and celebrated history of interesting content. Each station has multiple channels to choose from. ALL the above is run and supported by, “We the People”. No advertising of any kind or selling on our information, education platforms. – No special interest groups – No corporate entities. Just pure, honest freedom of speech, fact checked news and educational content without selling or an agenda. Fund raising for Disaster Relief or Crisis Management is distributed directly to approved agencies and are closely monitored by the Foundation to make certain they are used for the purpose of the Fund Raiser.